I am a long-time fan of podcasts, and the Swedish Radio series P3 Dokumentär recently had a program about the infamous von Sydowska murders. Even though I lived in Sweden for several years and my Swedish husband has introduced me to many interesting aspects of Swedish history and culture, this crime was unknown to me. In 1932, the wealthy Fredrik von Sydow murdered his father and two servants, then fled with his young wife Ingun. As the police closed in, he shot her and then himself. In the nearly 100 years since the crime was committed, no one has really known what the motive for such a random and senseless act of violence could have been. I was very interested to hear that someone connected to the family had written a book about the case. Helena Henschen was the daughter of Fredrik's sister Marianne, who was 15 years old at the time of the crime. 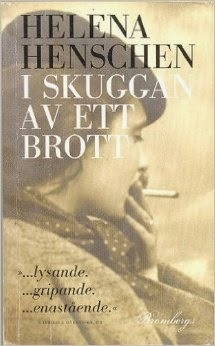 The book I Skuggan av ett Brott (In the Shadow of a Crime), is somewhat unusual. It's classified as fiction, but there is plenty of factual information included. The author (who sadly passed away in 2011) interviewed people who were connected to the crime -- her mother (although she was always reluctant to discuss it), the von Sydow's daughter Monica, a sibling of one of the murdered servants, etc. as well as used public records and archives to reconstruct the facts of the story. There were events, however, where no documentation was available, and in those cases she constructed an imagined narrative of what might have happened based on the facts that were known. These events include how Fredrik and Ingun (called Sofie throughout the book, for some reason) met, Ingun's troubled relationship with her step-mother, and so on. The story is fascinating in part because it involves people who moved in extremely privileged circles. The von Sydow family was especially rich and powerful. Fredrik's father, Hjalmar, was a well-known politician and leader in the Swedish Employers' Confederation. Ingun's father was also a very successful businessman, but he wasn't successful enough (or from a prominent enough family) for Fredrik's father to approve of the match. Fredrik and Ingun met because their families had neighboring summer houses on an island outside Stockholm. They also had another thing in common -- absent mothers. Fredrik's mother abused morphine and cocaine (which her son also reportedly did) and died when he was young. Ingun's mother ran off with a Romanian musician and left her husband and four children. The children were never told what happened to their mother; she was simply gone one day and never mentioned again. Despite parental objections, Ingun continued to see Fredrik and when she became pregnant, she was sent to Italy to have the baby. Her step-mother's sister lived there, and the baby girl was left with her (although Ingun did eventually take custody of the child when she was around two years old). When Ingun returned to Sweden, she and Fredrik resumed their relationship and were eventually married, although they continued to live apart. Fredrik, although a law student, was a typical spoiled brat: lazy, frequently drunk, and chronically short of money. Not long before the murders, Fredrik awoke to find his bed on fire (likely the result of passing out while smoking) and jumped from a three story window to escape the flames. He suffered numerous broken bones and other injuries, so is it possible that what happened later was the result of some head trauma? It certainly no doubt increased his consumption of drugs. His behavior was so erratic that Ingun had filed for divorce, although she couldn't bring herself to go through with it, especially after he was injured. On March 7, 1932 Hjalmar von Sydow's niece, who was living with the family, came home from school and discovered the bodies of Hjalmar, the maid Ebba Hamm and the cook Karolina Herou. They had all been beaten to death, likely with an iron bar. Since Fredrik was missing, the police immediately began searching for him. Several visitors to the flat throughout the day reported that Fredrik met them at the door and wouldn't allow them in, but they did glimpse Ingun inside. She had apparently helped to clean up the blood (although why bother when you leave 3 bodies behind?). After attempting to clean up the apartment, Fredrik and Ingun ordered a taxi and made a number of stops. At one of them, Fredrik visited a friend and borrowed a pistol (the friend apparently didn't ask too many questions). The champagne and oysters were flowing when the police managed to track the couple down at a restaurant. Wanting to be discreet, the police asked a waiter to inform Fredrik that they wished to speak to him outside. Fredrik and Ingun got up and walked toward the door. Suddenly, in full view of several witnesses, Fredrik leaned forward and whispered something in Ingun's ear, then pulled out the pistol and shot her in the head. He immediately then turned the gun on himself. While the bare facts of the crime are well-known, this book is fascinating for the glimpse into the world of the surviving family members. The author's mother was more or less shunned for the rest of her life -- so much so that she eventually moved with some of her children to Denmark to escape the notoriety. In later years, she informed her daughter Helene that she had burned all the photos and letters from her family. She was always reluctant to answer any questions about the case, so no doubt the author's curiosity was increased by the secrecy surrounding her family's history. I enjoyed the story a great deal, and of course it was fascinating to read the author's interviews with people who were directly affected by the events that happened so long ago. I appreciated the mix of fact and fiction that made this an interesting look into a tragic event.